I often encourage people to develop as much as possible in desktop browsers when they are building PhoneGap applications. While there are remote debugging tools such as weinre for remote debugging on devices, the developer experience is still better inside of a desktop browser because it gives you breakpoints and memory inspection capabilities. In most cases, you can develop the vast majority of your application within the desktop browser, and switch to a physical device when integrating with PhoneGap APIs or for performance testing. Personally, I use Chrome, and take advantage of the Chrome Developer Tools. XMLHttpRequest cannot load (filename or url). Origin null is not allowed by Access-Control-Allow-Origin. 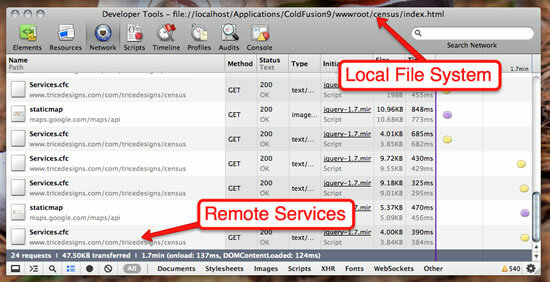 Luckily, there are a few tricks you can use to get around this… local HTTP servers and relaxing the browser’s security. Note: I’m on a Mac, and I don’t know the syntax for these on Windows. An HTTP server will start, and you’ll be able to access any content from that directory and child directories from the URL http://localhost:8000/ Thanks to @mesh for this trick. However, this will only work for static content that is within your directory structure. If you need dynamic content, you’ll need some sort of application server infrastructure. OK, that’s great, but it doesn’t cover every situation. What if you don’t want a local application server configuration? What if you want to develop against services that are remote, and you don’t control them? Well, you are in luck. Using this configuration, you’ll be able to open an HTML file from the local file system, and that file will be able to make requests to other sites to access data or other resources. In the screenshot below, you can see that I launched my Census Browser application from the local file system, and it can access services from http://www.tricedesigns.com. With the default browser security policy, this would not be possible. WARNING: ONLY USE THIS FOR DEBUGGING! Do not use this configuration for normal web browsing because it will leave your browser security wide open, and able to be exploited and compromised. Do not browse the web when you’ve relaxed the security policy. Thanks to fellow Adobe evangelist Piotr Walczyszyn for introducing me to this trick. Previous PostPushing Data to a PhoneGap Web ViewNext PostWelcome, Adobe Shadow! The other thing that really helps with desktop debugging is an emulator/simulator of the PhoneGap API. Is there any alternative for doing this?